You'll either love it or hate it. If you live in South East Asia you would have likely come across this particular bean. In Malaysia and Singapore, it is known as Petai. The botanical name for this is Parkia Speciosa. 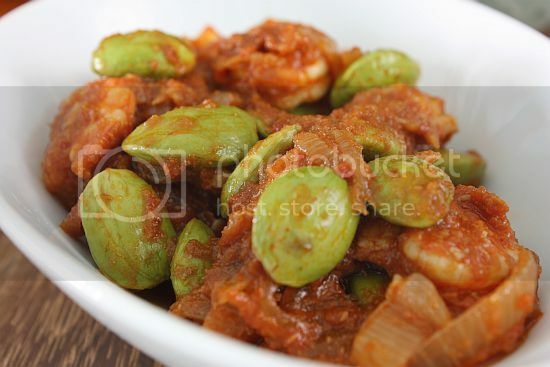 To the layman, it is known as stinky beans and it is really an acquired taste. Reason being is that it has a very strong all-pervasive smell that lingers in the mouth and in the excretory systems of the body. The beans are popular in Asia, particularly Malaysia, Northern India, Indonesia and Thailand. They are sold in clusters, still in their pod, or the seeds are sold separately in bags. 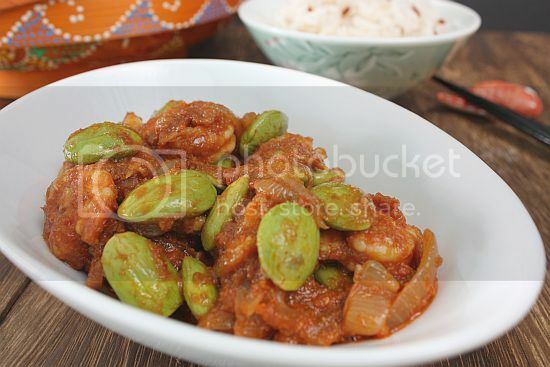 Petai beans or seeds look like broad beans. Like mature broad beans, they have to be peeled before cooking. The beans are known to help in treating depression, premenstrual syndrome (PMS), blood pressure, diabetes, obesity and constipation. 1) Heat oil in wok and fry the ground shallots and lemon grass till fragrant. Add the sliced onion, chilli paste, chili padi and shrimp paste and saute for a minute. 2) Add tamarind juice and continue to stir till the desired consistency. 3) Add prawns and stir till three-quarters cooked. 4) Then add in the petai and cook for about two minutes. Add sugar and salt to taste. 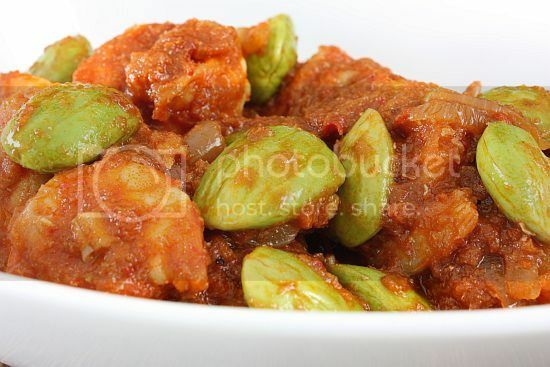 5) The petai should be just half cooked to taste good. This is a dish I hated as a child but would LOVE to try to eat now. Yours look lovely especially the chilli paste. I've heard of the beans before, but never had them. The dish looks gorgeous - I like the contrast of the bright green beans to the spicy shrimp. I used to hate it too till recently, somehow, when ones getting older, I become more daring to try stuff that has medical benefit. My hub and I love these beans. In fact I have a packet sitting in the fridge. Yup, I shall cook it tomorrow and make it spicy like yours. Like Noobcook I hated it when I was young but now I don't mind having it once a while.